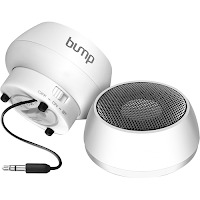 As part of Best Buy's Daily Deals get a BUMP wireless portable speaker for $20. That's half-off the regular price and includes FREE shipping or in-store pickup. You can plug it in directly to your listening device, but it also has Bluetooth capability so you can listen wirelessly from select mobile phones, PC,and Apple products (Mac laptops, iPads, iPhones, etc). It's also got a rechargeable lithium-ion battery. Imagine you're sitting on your couch, taping away on your device. You get the urge to listen to Cotton Eyed Joe. You want the rest of the house to come out dance in front of you, because if you play that song it just happens. You place your BUMP on the mantle, crank the song up, and watch the entertainment come to you. Click here to view the offer at Best Buy.